One more common question I get, is about what snap should I suggest about putting on the end of the leader. Snaps have absolutely no place here. No matter if it is a snap lock, or the best snap on the market, eventually it will open, and probably it will do it when you have a nice fish on the other side. 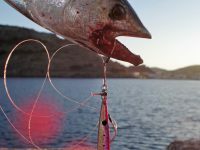 The nature of shore jigging is very energetic and very strong, so each time we jig, the jig connection gets a big amount of stress. All the metals there hit each other and it is impressive that exactly like Houdini can always find a way out of the box, the same goes with our jig that sometimes can even escape a bad split ring. So the best connection we can choose to use is the solid – split connection. I use two safe and powerful ways. Option 1. This is my personal favorite because of the speed the assist hooks moves during jigging. Also i love it because i can change jig or assist hook fast! 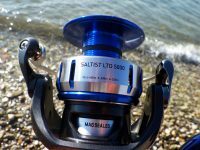 Option 1.This connection serves many important things like changing easily the jig, allowing the assist hook to move fast, and almost guarantee us no troubles. So the connection goes like this. We tie to our leader a high quality solid ring. Then we attach to it a high quality split ring. In this split ring we add the solid ring that carry the assist hook and we also add the jig. This connection is an all round connection that can serve us well in most cases. What we should look carefully is that we need to use HIGH QUALITY solids and splits to be sure that we can put as much power during a fight, as we can. 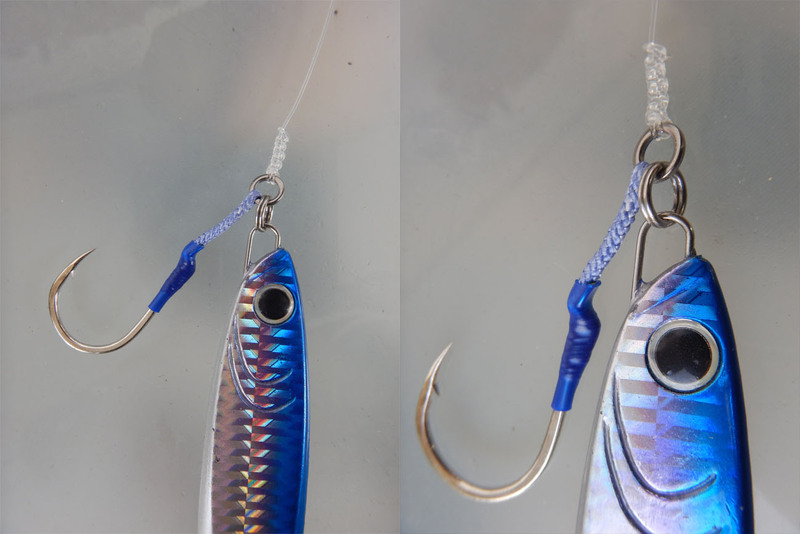 With this connection is easy to change both assist hook and jig or only the jig, since the assist hooks stays on the split ring, as long as the length of the assist hooks fits to the next jig. Option 2. 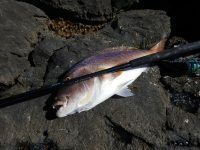 This is a very good choice when you want to deal with monstrous fish, so you take out the split ring from the “war”. Easy to change jigs, terrible fro changing assist hooks, since it needs new knot over and over again. Option 2. 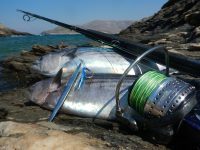 One more option when you go for very big fish is to tie the solid that carry the assist hooks directly to the leader and on it add a split ring and the jig in it. 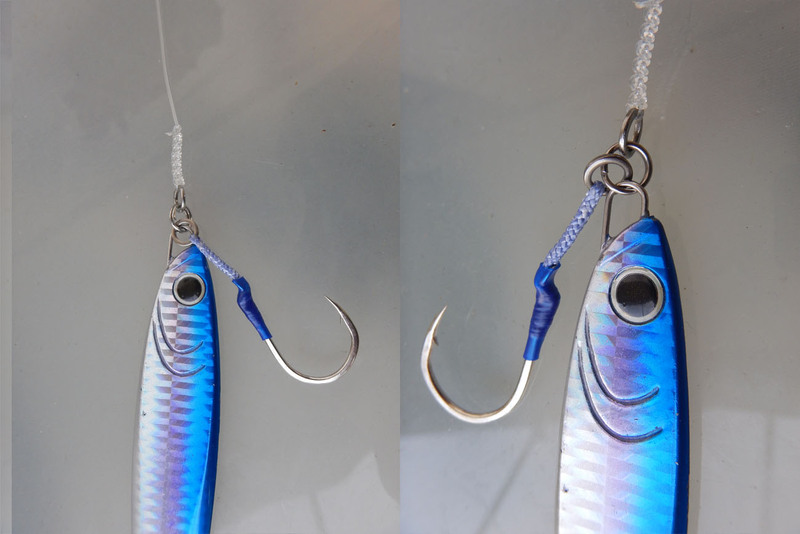 This combination guarantees no loss from an open spit ring, since the first solid gets the whole shock and stress but the assist hooks move slower during jigging, and after strong use, the strands in the assist hooks start to break and this makes it weaker. 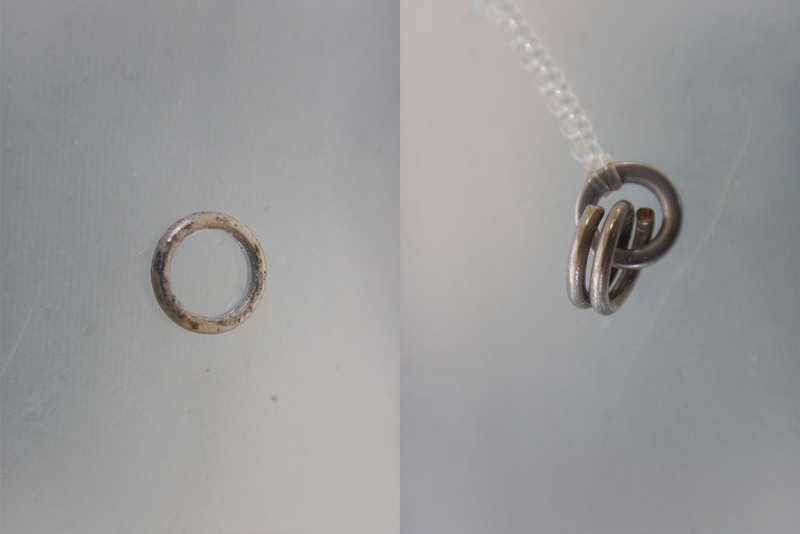 LEFT: Rusty solid rings will damage the knot of the leader because they are not smooth and eventually will break it! RIGHT: Solid ring with “memory”. This is for sure the worst option. AVOID it! Important Tips: The split rings must have no “memory” that means that after every change of jig, they must stay closed tightly! Also they must be strong enough that the change of jig can be done only with the help of pliers. 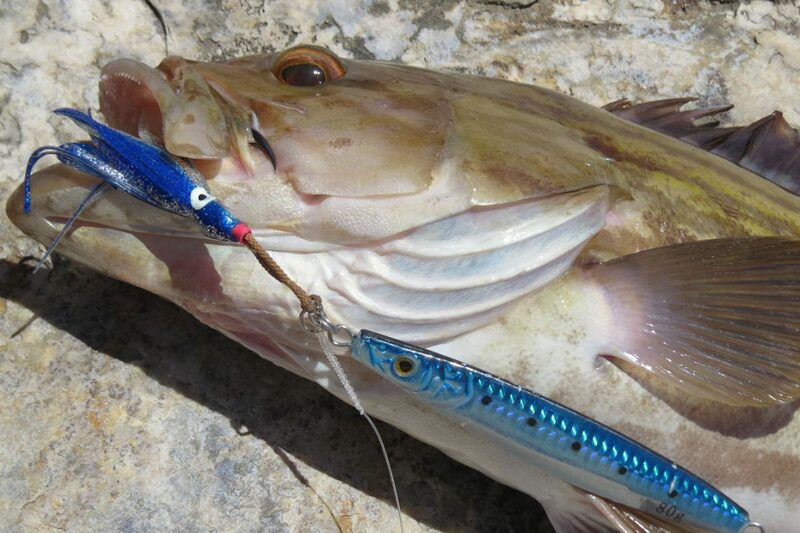 If solids are soft enough and open easily, then they are not suitable for shore jigging. Also if the solid rings tend to rust and are not from 100% high grade stainless steel, they will injure the knot of our leader during high tense and bye bye fish! So be very careful and use only high quality products. The normal size of splits and solids I use, depend from the “heaviness” of the gear and they start from size #3 to end up sometimes to as high as #5 and very rarely more. 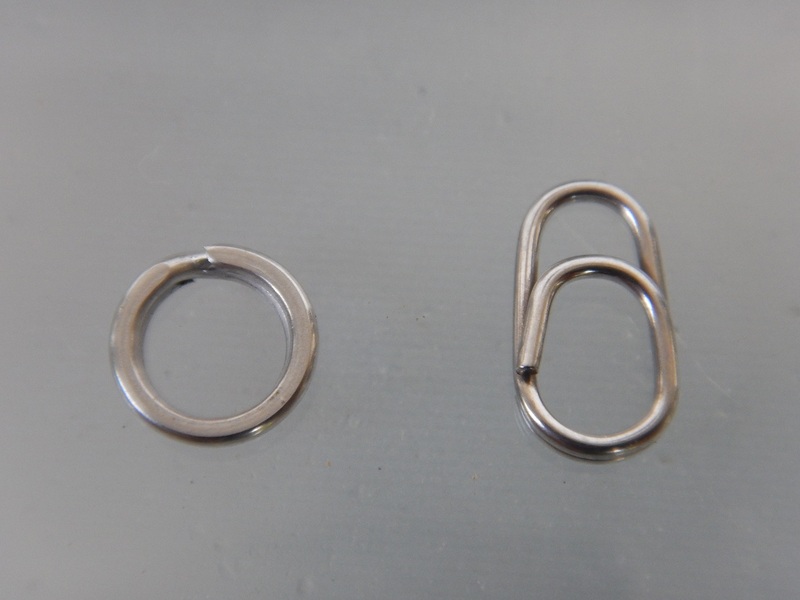 LEFT: A “Ten mouth” split ring with all the made in japan quality can have! RIGHT: Studio Ocean Mark Snap! An alternative choice for Option 2 only!